BlackBerry has started rolling out its first Android powered phone, the BlackBerry Priv, at certain retailers in the U.S. For example, the slider is now available at big box retailer Best Buy and office supply chain Staples. Starting today, BlackBerry has greatly increased the distribution of the Priv in the U.S. as the phone can now be ordered from Walmart's online store. Once the phone has been purchased online, it can be shipped to the buyer's home, or picked up at the nearest Walmart location. 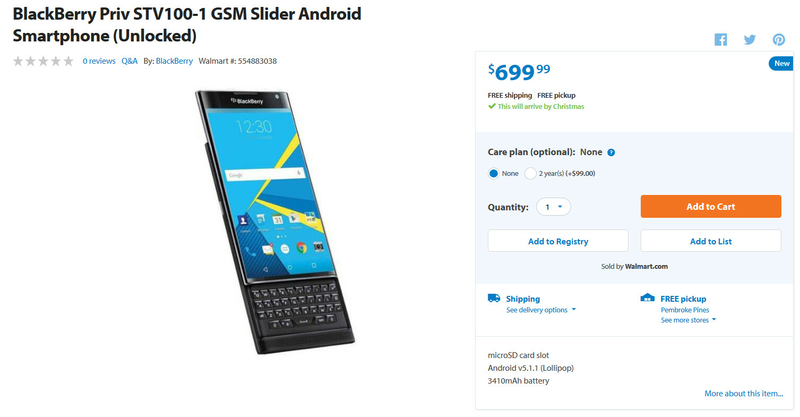 The model being sold at Walmart happens to be the same unlocked version (STV100-1) that BlackBerry is peddling on its ShopBlackBerry website. The only other version of the phone offered in the U.S. is the AT&T branded Priv available from the carrier. Back in October, a picture of the Priv running on the Verizon network was spotted on Instagram. Last month, Big Red sent out a tweet saying that the Priv is "coming soon". While the Priv is now being sold by the largest discount retailer on the planet, there is no change in the pricing of the handset. The Priv is $699.99 at Walmart, the same price that BlackBerry charges for the phone on its website. ..ridiculous pricing and i found the phone to be something less than good..unfortunately! A test the waters approach. They just need to drop the price and marshmallow if they want it to sell well. I agree the price is too steep but it's their first outing and they have done better than most when comparing firsts. I'd really like a BB metal phone... minus the kb. Let's see how BB designs one. Should be gorgeous. You can literally tape/glue the keyboard and the slide won't come out. The phone looks great and the price is reasonable by my opinion. Though with latest news related to government backdoor for encrypion, I think that I will stick with my 9900 Bold from PhantomEncrypt. Nice to see more avenues opening up in which one can purchase the Priv. It's even available at BestBuy as well. The Priv is a great device and the price is in line with other phones with similar hardware. With the Priv, you also get security, Blackberry's software package and HUB and a PKB, so the price is well within range of it's "peers". Price is not a problem for me especially comparing the cardboard phones made by Apple. I was planning to get one for my Kid this Xmas and one for myself later on but I was very disappointed, in fact quite upset at Blackberry, for not Include FM Radio, at least on the Unlocked Version. I'm sure there are thousands of people who feel the same way but I guess disappointment has becoming Blackberry's trademark lately so what's the big deal! I have dumped Samsung long ago because of their decision do dump FM Radio so looks like Blackberry will be in my list of stay way for now even though they make the best Hardware and some of the best ever. By the way, I had a dream about QNX running on all platforms including desktops. Windows has been torturing humanity for too long.